TORONTO, Jan. 22, 2019 /CNW/ - Namibian lithium developer Desert Lion Energy Inc. (TSXV: DLI) (OTCQB: DSLEF) ("Desert Lion" or the "Company") is pleased to announce that it has successfully completed the acquisition of Exclusive Prospecting License ("EPL") 5718 and has fulfilled its commitments in connection with the issuance of the Phase 2 Mining License (ML204). 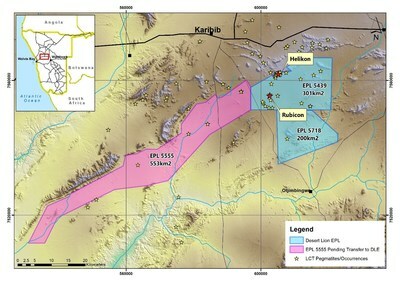 EPL 5718 covers an area of 200km2 and is located immediately adjacent to and south of Desert Lion's existing EPL 5439 and contains several priority structural targets that are considered to host Lithium – Caesium – Tantalum ("LCT") type pegmatites. As part of the Transfer Agreement, Desert Lion paid approximately C$130,000 cash and 80,906 common shares of the Company, of which C$30,000 was paid in cash on execution of the Transfer Agreement. An additional cash payment of approximately C$100,000 was paid upon completion of the transfer to Desert Lion. Desert Lion is currently in the process of completing the acquisition of an additional EPL, EPL 5555 that covers an area of 553 km2. EPL 5555 is located adjacent to and immediately west of EPL 5439 and is known to contain several LCT type pegmatite occurrences and workings. Both EPL's are largely underexplored with respect to LCT type pegmatite mineralization, and contain host Pan African age (500Ma) syn and post tectonic granites that are considered to be sources of LCT type pegmatites. Abundant late stage pegmatites have been mapped intruding both EPLs; these are thought to have been emplaced during the end of phases of granite intrusion and are therefore considered highly prospective. The acquisition of EPL 5718 and pending acquisition of EPL 5555 will increase the Company's ground holding in this prospective part of the southern pegmatite field in Namibia's Erongo Region. Upon closing of the acquisition of EPL 5555, the Company's ground holdings in Namibia will cover a total of 1,054km2. "We are excited to have acquired EPL 5718," commented Tim Johnston, CEO of Desert Lion Energy Inc. "This EPL represents significant optionality for our organic growth profile, which we plan on testing as we move forward with our 2019 exploration program." Following the issuance of the Phase 2 Mining License (ML204), announced August 27, 2018, the Company has fulfilled the requirement of issue of 476,190 common shares to Desert Lion's local partner group, Huni Holdings (Pty) Ltd. In accordance with applicable securities laws, the issuances of common shares described herein are subject to TSXV approval and will be subject to a hold period of four months and one day from the date of completion of settlement. Desert Lion Energy is an emerging lithium development company focused on building Namibia's first large-scale lithium mine to be located approximately 210 km from the nation's capital of Windhoek and 220 km from the Port of Walvis Bay. The Company's Rubicon and Helikon mines are located within a 501 km2 prospective land package, with known lithium bearing pegmatitic mineralization and the Company is currently in Phase 1 of its production plan, producing and exporting lithium concentrate from stockpiled material. The project site is accessible year-round by road and has access to power, water, rail, port, airport and communication infrastructure. This news release contains "forward-looking information" within the meaning of applicable securities laws. Generally, any statements that are not historical facts may contain forward-looking information, and forward-looking information can be identified by the use of forward-looking terminology such as "plans", "expects" or "does not expect", "is expected", "budget" "scheduled", "estimates", "forecasts", "intends", "anticipates" or "does not anticipate", or "believes", or variations of such words and phrases or indicates that certain actions, events or results "may", "could", "would", "might" or "will be" taken, "occur" or "be achieved." Forward-looking information is based on certain factors and assumptions management believes to be reasonable at the time such statements are made, including but not limited to, continued exploration activities, lithium and other metal prices, the estimation of initial and sustaining capital requirements, the estimation of labour and production costs, the estimation of mineral reserves and resources, assumptions with respect to currency fluctuations, the timing and amount of future exploration and development expenditures, receipt of required regulatory approvals, the availability of necessary financing for the Project, permitting and such other assumptions and factors as set out herein.